One hundred and twenty-two children do not die from drought in a day. 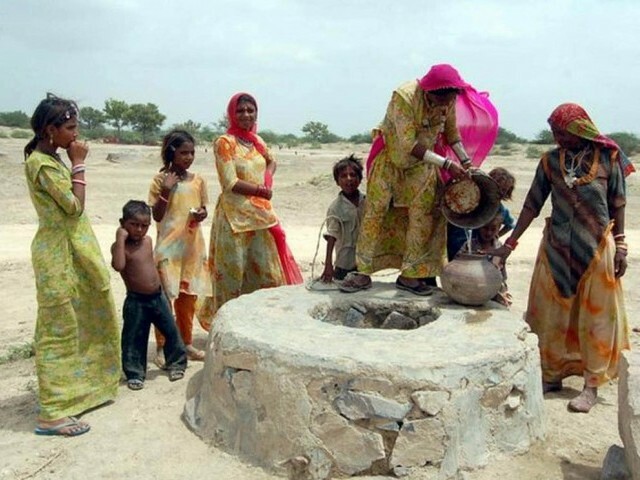 They die a slow, painful death when the symptomatic effects of three years of drought in a parched arid area like Tharparkar reach a stage that it becomes a full-blown famine. As the world looks on in amazement how this “breaking news” was hitherto not paid attention to, what must be understood is that this was happening all along, slowly and gradually. Officially, however, some 122 child deaths were recorded in Thar since December 2013. Local experts are concerned that this could only get worse unless drastic measures are adopted. Tharparkar district, with an estimated population of 1.5 million, is ranked by the World Food Programme as the most food insecure of Pakistan’s 120 districts. Rukaiyya, a seven-day-old baby from Adam Rind village lost her battle for life. She was one of the casualties of the dire situation in Tharparkar. “My wife Zeenat herself is so weak. We are very poor people. I used to rely on some basic agriculture which is no longer there due to lack of rain. This was my first child,” said Ghulam Hussain, the father of the child. This desperate father took the sick baby to a private doctor in Umerkot. He chose not to go to the nearest public hospital in Umerkot, some 50 km away from their village. “We are too poor. The doctors there would not pay attention to us.” Hussain is convinced that lack of proper food and nutrition is the reason behind this tragedy. There are many overlapping factors that are at play behind the recent acceleration in deaths in Tharparkar. More than 90 per cent of the district’s population relies on underground water they get through dug wells. In the absence of rain when this water is not recharged, the water levels go down. If at all water is available, the concentration of salt in it reaches high levels which makes the water unfit for consumption. The people of Tharparkar rely heavily on cattle for their livelihood. Cattle gives them food and money, both. Absence of fodder forces them to migrate. Partial migration trends show that often the men migrate along with their cattle. The women, children and family members left behind are thus deprived of the little protein they usually get from the dairy products. The impact of the drought is thus exacerbated and malnutrition becomes even more serious. The cause of the famine in Tharparkar is both a decline in the availability of food as well as a reduction in people’s access to, or their ability to acquire food. Malnutrition is a common problem in Tharparkar, with many children in particular displaying classic signs of malnourishment at the first glance. Bleached out hair, thin upper arms and disproportionately enlarged bellies are common sights. According to the National Nutrition Survey, more than 70 per cent of mothers in Sindh are deficient in vitamin D. Nearly half of the children under five years old suffer from stunting and around 40 per cent of children are underweight. Children born to malnourished mothers and suffering from malnourishment over long periods of time have severely compromised immune systems. Thus even a bout of cough or cold will be enough to kill such a child, which explains why the cause of death in the records of many of these children will be reasons like Pneumonia, diarrhea and infections. The newly appointed District Health Officer (DHO) Tharparkar, Dr Abdul Jalil Bhurgri, told The Express Tribune that media should base their reporting on facts. “The way it is being reported will spread a wave of panic among the people. It is partially incorrect that these children died due to hunger and malnourishment. There are other reasons too like unskilled birth attendants and child delivery in unhygienic conditions due to which mother and child can both contract infections.” Dr Bhurgri invited expressed willingness to share their official data with anyone interested to set the record straight. While he agreed that there are not enough doctors and health facilities in the district, he denied that all these deaths are famine related. Published in The Express Tribune, March 9th, 2014. Posted in Human Rights, Pakistan and tagged Bilawal Bhutto Zardari, drought in Tharparkar, famine in Tharparkar, Mithi, PPP, Tharparkar. Bookmark the permalink.